On microscopy and molds, by Kathie Hodge, your smitten editor. If you’ve looked through my blog archive, you’ll know that I’m rather biased toward the small. Infatuated might be a better word. I don’t plan to get over it any time soon. It’s hard to get into small. A while ago I encouraged you to get a good hand lens (like this one). That’s an awfully good start, but perhaps it’s just the beginning? A hand lens might simply reveal to you all the good things you’re missing! Because really, you might want a microscope. Yes, you. And here the learning curve gets a little steeper, because now a whole thicket of questions springs up: which one? which objective lenses? how does one use it? and how to make a good slide? You’ll need to acquire a little know-how to get yourself started, even if you once peered down a microscope in high school. Perhaps your mushroom club offers a microscopy workshop, or you might find such a thing at a foray or at a friendly local school. In any case, it isn’t hard, so why not go for it? Lastly, one ring to rule them all: You’ll need a good book. Until recently, this was tricky if you liked molds, since there were few current and comprehensive books to recommend, but now there is a new sacred text, The Genera of Hyphomycetes (2011) by Keith Seifert, Gareth Morgan-Jones, Walter Gams, and Bryce Kendrick (CBS Biodiversity Series). It’s not cheap, but it IS cheap for its size (7.25 pounds, 997 pages), its scope, and its remarkable illustrations [page previews here]. You can buy it here [at CBS in the Netherlands] or here [via APS Press in North America]. This is that game-changing kind of book that provides an exhaustive synthesis and review while opening the field to new learners. You can identify the diversity of molds to genus here–that should keep you busy. And then this book will point you to the right literature to ID them to species. It’s astonishing, and I’d like to congratulate the moldy authors–and I mean that in the best way– who are hopefully lying back in their hammocks after this stupendously successful effort. When I say Microscope I mean a compound microscope–to see something using such a device you first mount your specimen on a slide, apply a drop of some liquid and a cover slip, and then, ta da!! Now, I also have a dissecting microscope, which is like a big giant hand lens with two eyepieces, but you don’t especially need one of these. If you’re shopping for a compound microscope for molds or mushrooms, you’ll want one with a 100x oil immersion objective, which will give you 1000x magnification (you get an additional 10x from the eyepieces), and some lesser objectives, most often 10x and 40x. 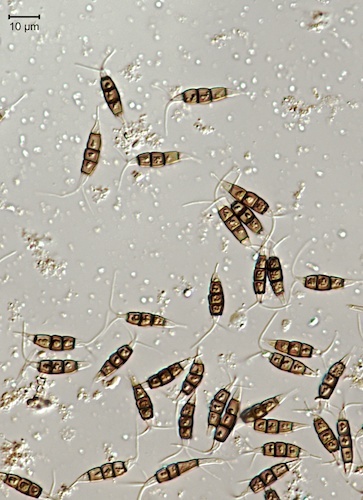 You need that kind of 1000x power to see and measure mold spores. To give yourself a sense of scale, check out this awesome website, which zooms in from coffee beans to… teensy. Note the token fungus (baker’s yeast) on your way in–a yeast cell is about the smallest thing we can see well with a typical compound microscope. Here’s a little tutorial from the University of Wisconsin at Madison about how a standard student scope works. There must be other tutorials out there. Perhaps someone can recommend one that is instructive and yet compelling for novices? 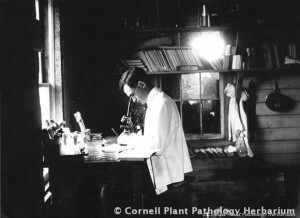 In black and white, we see an image from the Cornell Plant Pathology Herbarium: Cornell scientist Errett Wallace at his not-very-ergonomic microscope, image CUP-07892d. Errett used his scope to figure out that, on a rainy day, a square inch of old apple leaf bearing the lesions of apple scab could shoot out about 25,000 spores within 45 minutes. Therefore, BILLIONS of Venturia inaequalis spores might be aloft in an untreated apple orchard on a damp spring day. Berkleasmium and Pestalotiopsis images are by me, Kathie Hodge. Aren’t they pretty things? This sure makes microscopy interesting. I’m amazed to realize that something so small is that beautiful under the microscope. I have used Leo Tanghe’s “Using the Microscope” in microscopy workshops. It is an excellent primer. It was last published in Mushroom, the Journal Fall 1998. When I need copies I get in touch with Maggie Rogers, send her $2 per copy and reprint from a copy that I keep on hand. Otherwise, she’ll send out a copy. Leo J. Tanghe. Using the Microscope. Mushroom: the Journal of Wild Mushrooming. Vol. 16, no. 4 (issue no. 61), pages 12 to 26. 1998 [reprinted from Summer 1988, in memory of Dr. Tanghe]. Folks can obtain copies following the instructions here, at the top of the page.